Park of of the work of a dark vitalism is the sickening realization of such an image [Zuggtmoy, Queen of Fungus]. Steven Johnson’s Emergence begins with Toshiyuki Nakagaki’s work on slime molds in which he made one of the amoeba like creatures find a path through a maze towards a food. The mindless functioning of life, of life moving towards goals without any form of intelligence – creatures that function in a completely bottom up fashion (the rest). If Brassier unbinds and cosmically reinscribes Freud’s theory of thanatropic regression in order to extend the eliminativist vector all the way to the cosmic exteriority, then he must also unbind the theory of umwege beyond the organic life or bios. Because as Freud has explicitly argued and as Brassier has implicitly indicated, the thanatropic regression or the vectorial move toward the precursor exteriority is inextricable from the increasing convolution of the umwege. Here the convolution of umwegeor the increasing twist in the roundabout regression to the precursor exteriority must not be confused with the complexification of life as an opportunity for posthumanist scenarios, because it suggests the differential decomposition of all interiorities via nested deployment or intrusion of cosmic exteriority. After all, the emergence or determination of an index of interiority from a precursor exteriority does not mean the complete envelopment of that exteriority and its reintegration according to the laws of the interiorized horizon. There is always a part of enveloped exteriority that refuses to be assimilated within the index of interiority, thus extending the intrusion of the precursor exteriority into the emerged nested horizons of interiority (the rest June 11, 2009). 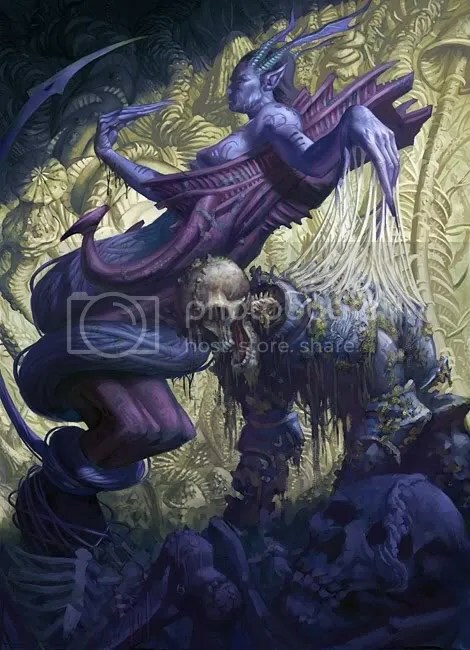 I want to take up this promotion of the Death Drive, and the image of the fungus Queen Zuggtmoy, so as to explore the fuller consequences of so called Dark Vitalism. Mostly I want to bring out how the figure – and we can think through a figure – of Zuggtmoy enables us to see an edge to the Death Drive that previously had been obscured, as if the side of the well-used coin. Life is ejected from the energy-blank and smeared as a crust upon chaotic zero, a mould upon death. This crust is also a maze – a complex exit back to the energy base-line – and the complexity of the maze is life trying to escape from out of itself, being nothing but escape from itself, from which it tries to escape: maze-wanderer. That is to say, life is itself the maze of its route to death; a tangle of mazings [Umwege] which trace a unilateral deviation from blank. Nature is both immediate, but then necessarily post to Spirit, come out of Spirit’s very apprehension. We can see if we undo this original preoccupation with (and centrality of) consciousness as a form of negation, we can see that Freud’s own dialectic unspools. The umwege that Freud says are the “ever more complicated mazings” that are the complexifications of life, no longer are made against a background of death and zero, but come out of it, just as we have prime images of fungi and moulds that seemed by traditional lights to grow right out of putrescence and decay. In an ontological domain quite far from Hegelian negativity, matter itself thinks. There is nothing to return to, (but not “nothing” to return to), and the weavings of umwege organization are expressive powers of tendril-like freedoms. It is here that I want to return to the powers of Zuggtmoy, in particular as they are manifested by the class of organisms slime mold. Naught Thought already directed us this way, pointing to Toshiyuki Nakagaki famed experiments with slime molds that seemed to demonstrate intelligence (referenced in Steven Johnson’s 2001 book Emergence). This is an intelligence I would like to think hard about because it defies some of our most common assumptions of the kind of forms intelligence must take. Slime molds are a curious limnal organism, that not only lives between realms that seem conceptual opposed, Life and Decay, but also taxonomically between our easy and dominate ideas of independent Individual vs. controling Group, not to mention what is plant and what is animal (once thought a fungus, now Protista). First let us engage the fascinating and seemingly conceptually contradictory lifecycle of slime molds, for they are neither individuals, nor colony, but participate in modes and versions of both. I propose that these examples serve as figures of philosophical analogy in particular for those brands of philosophy which like to juxtapose conceptual oppositions to be projected upon forms of life and the world. We are not going to be so forward as to assert that all things have the form of slime molds – though it does form an interesting counterbalance to explicit and implicitassumptions that “it” is like the human (or phenonemological consciousness, etc). What we are to hope is that the example of slime molds might help us overcome some of our more unconscious prejudices, especially when we engae in ontological imaginations. 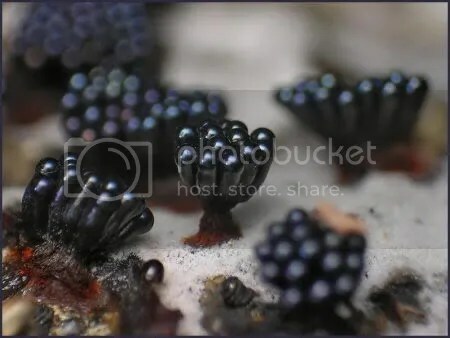 As eluded to, Slime molds are remarkable creatures as they spend part of their lives in seemingly independent Individual states, and part of the time in collectives (some of which threaten our idea of what constitutes an Individual). As you can see from the above, a lifecycle of a Plasmodial slime mold, in the haploid (single copy of a chromosome) form at the left the slime mold is either a spore or an individual cell; but, after syngamy, it begins to divide, not itself, but only its nucleus. It does this again and again until it has become one huge cell with thousands of nuclei, giving pause to the Platonic/Paramedian problem of the One and the Many, here the One being a coagulate of the nucleic many. In the Plasmodial stage the huge single cell creeps along in search for food until it eventually forms a sporangium, fructifying stalk, very much like a mushroom, which eventually will put forth the multitude of haploid spores. To make this clearer, here below is the Plasmodial stage wherein all the individual amoeba-like cells have shed their cell walls, and the single form crawls across a supposedly “dead” territory. One can practically see the Fruedian encrustation of life, the umwege wending its way back toward Death. And there is a second kind of slime mold (and a third not to be discussed) which begins in an amoeboid form, a single cell that instead of following a path of nuclei division and expansion, expends its life in solitary fashion until food becomes scarce, and emitting a aggregating chemical signal to be read by other isolated slime mold cells. Once a density threshold is crossed the mold cells cluster together to form one great colony which acts as a singular organism again confusing some of our more easy categories of self and group. All slime molds start life as a single, microscopic cell, and eventually end up as that puddle of goo. A plasmodial slime mold, like the one that researcher Toshiyuki Nakagaki coaxed through a maze (see article), constantly grows and divides. But instead of breaking itself into two new cells, it divides only its nucleus, becoming one larger cell with two nuclei. This process repeats until the plasmodium is a giant cell, like a sac of jelly, filled with thousands of nuclei. Ever so slowly, the plasmodium creeps across the forest floor, eating the tiny bacteria and yeast it finds there. A different group, called the cellular slime molds, stay microscopic for most of their lives. They, too, live and feed in damp soil. When food gets scarce, though, these slime molds have an amazing trick for survival. Each individual sends out a chemical signal, allowing the slime mold cells to find each other. Then they aggregate, or stick together, until they have formed a giant roaming blob. This blob looks and acts like one creature, even though it is really thousands of individuals oozing along together. Despite these differences, both kinds of slime molds complete their lives with an amazing final transformation. Either slime mold (plasmodial or cellular) keeps crawling along until it reaches a drier spot. There, it stops and metamorphoses into a sporangium: a tall, thin stalk with a sac on top, similar to a mushroom. 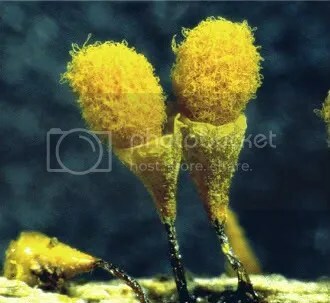 The slime mold cells turn into stalk cells, or sac cells [about 20%], or spores [about 80%]. Finally, the cells that have become spores burst out of the top of the sporangium and are blown away by the wind. Where they land, they will start their life cycle over, invisible-and individual-once again. The slime mold aggregation is controlled by chemotaxis toward higher concentrations of cyclic adenosine monophosphate (cAMP). (cAMP is a common intracellular messenger in higher organisms.) The onset of starvation causes some cells to produce and secrete cAMP. Extracellular cAMP binds to receptors on cells and initiates two processes. The first, and faster, process activates the adenylate cyclase enzyme which causes production of cAMP. This cAMP is secreted; it can then bind to the same cell, further stimulating cAMP production, and to other cells. The second slower process leads to inhibition of adenylate cyclase. This second process stops the autocatalysis. The extracellular cAMP diffuses away and is degraded by phosphodiesterase, which is secreted by the slime mold cells. Once the level of cAMP has fallen the cells begin to regain the ability to synthesize cAMP. No doubt this leaves us laymen with a sense that we are dealing with the bizzare and transmogrifying edge of animal/plant, and extra-somatic behaviors, ones that allow us to detach ourselves from common notions of when and where the body ends. Cellar slime molds in particular seem to have an intensified sense of Individual and swarm, wherein the field of organization is almost forced to include a semiotic dispersion of the signal itself, with great fineness to the pattern by which they are clustered into a new, single acting entity. If Zuggtmoy powers exist here, they seem exemplified by questions of division, dispersion, unification and semiotic binding. Now I would like to turn to the more pronounced “intelligence” features that seem to have been discovered within slime molds. What seems at first blush the very least discerning of vegetable/animal matter, has shown remarkable capacities for behaviors which only “higher” animals could accomplish. Toshiyuki Nakagaki of the Bio-Mimetic Control Research Centre, Nagoya, Japan, placed pieces of Physarum polycephalum in an agar gel maze comprising four possible routes. Normally, the slime spreads out its network of tube-like legs, or pseudopodia, to fill all the available space. But when two pieces of food were placed at separate exit points in the labyrinth, the organism squeezed its entire body between the two nutrients. It adopted the shortest possible route, effectively solving the puzzle. The organism changed its shape, according to the researchers, to maximize its foraging efficiency and therefore its chances of survival. The meal of ground oat flakes led to a local increase in contraction of the organism’s tube-like structures, propelling it towards the food (from this summation). The maze was created by laying a maze template down onto a plate of agar. 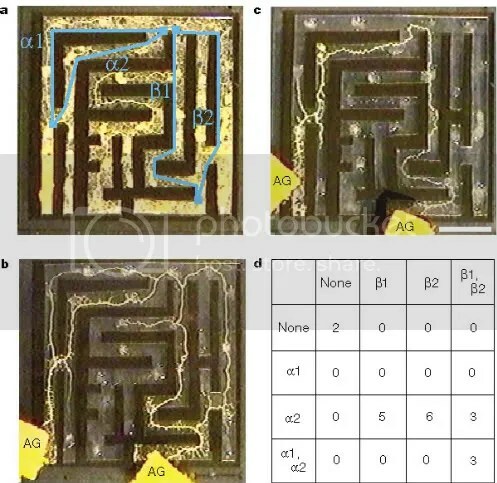 In the first part of the experiment, pieces of slime mould Physarum polycephalum were placed throughout the 3 x 3cm maze. 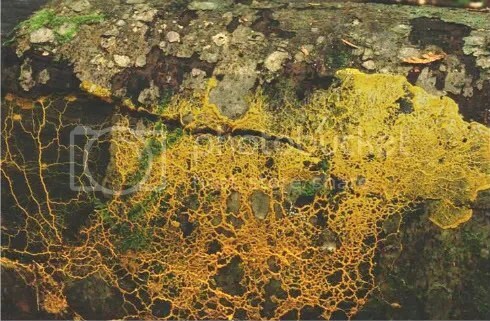 To grow, the slime mould throws out tube-like structures called pseudopodia, and it soon filled the entire maze. The maze had four routes through, to get from one exit to the other. Food was placed at both exits, and after eight hours, the slime mould had shrunk back so that its ‘body’ filled only the parts of the maze that were the shortest route from one piece of food to the other. The researchers suggest that as the parts of the plasmodium come into contact with food, they start to contract more frequently. This sends out waves to other parts of its body which tell give feedback signals as to whether to grow further or contract. Ultimately, to maximise foraging efficiency, the plasmodium contracts into one thick tube, running through the maze. Surely the visual aspect of the maze gives us an impressional sense of “intelligence” whereas the description allows something more like a directed motility, but really, is there a difference between the two? In a certain way the slime mold has “represented” the territory space, not pictorially, but semiotically, instilled differences within itself which spell differences in the world such that a certain economy, a judicious precision, is achieved. But slime molds seemingly are capable of more than spatial genius. They have also a primordial memory, a manner by which they can space out time in regulative and anticipatory rhythms, having learned what tends to happen. Last year Nakagaki released a paper detailing the new co-ordinated and seemingly mental capacities. It is reasoned that propagation pathways change with experiences, and thus retain under rhythmed cycles the form of temporally governed action. The pattern without changes the pattern/paths within, such that even the dumbest of cellular life is musically oriented towards states it seems it could never proximately sense. So what has this rumination over the biological and bio-mental capacities of slime molds given us in regards to the original philosophical question, other than reminding us that there are some remarkable and probably as yet undiscovered characteristics of even what we take to be the simplest forms of living things? 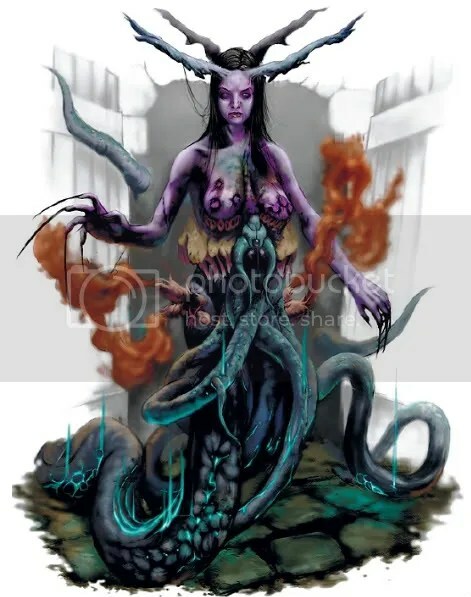 I offer, let us reimagine the demoness as a primordial power, one iconically represented by slime mold organism over which she is thought to rule. What would Zuggtmoy’s relationship be to “death” and the Death Drive. Slime molds we know are fundamentally oriented towards decay. Ammonia presents a near universal signal for the presence of putrification such that the entire feeding action could be said to oriented towards its presence (like Jakob von Uexküll’s tick). In this way the slime mold is determinatively and semiotically oriented towards death. I want to perhaps poetically concentrate upon this very thin radiance of life that exudes from decay and ultimately death. 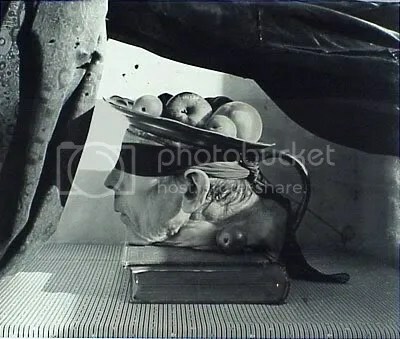 One can see it with the very ocular and stunning effect the grotesque has upon the eye, the way that objects such as those that one might find in Joel-Peter Witkin’s gallery, shimmer with an odd kind of microbial sheen, the way the eye is forced to traverse the object as if it were covered with serpentine forms or trajectories. I suggest that there are two things going on under the conflation of the Death Drive. There is first of all a needed explanation of the supposed Repetition Compulsion, the way in which a person (organism) inordinately repeats past trauma undermining pleasure pursuits. The apparent contradiction when placed within a Hegelian like concept of negating consciousness necessarily pressed Freud to conceive of a drive with a very different kind of aim, the aim of a return to a Death State. In typical mytho-anecdotal Freudian fashion, Freud watched a small boy toss and retrieve a spool in Fort/Da binaries only to be conflated into Being and Non-Being manipulations in philosophies of (ocular) presence. Yet, do we not see an elemental mode of the Repetition Compulsion in the most recent Nakagaki experiments on slime mold? As the slime mold slows its movements in anticipation of a cyclictic gust of dry air, are we really to say that we are finding the roots of a Being/Non-Being pre-occupation? Further, are we to deny that the slime mold has no pleasure principle circulations of its own coherence amid the anticipation? And if we were to grant a capacity to actually affect the environment in such a way that the trauma could be influenced to be repeated, would such an investment really be a Death Drive, or rather the celebration of internal coherences and environmental contrapuntal interweave. The pleasures of internal coherence, even amid outcomes of pain, are Pleasure Principle pursuits, and we might agree with Spinoza that it is our direction towards such coherences which gives us our Identification with what is beyond us, for the philosopher ultimately with Substance. There is no essential contradiction between Pleasure and Repetition, though most certainly Repetitions ever are expressionally in need for their expansions, their umwege into greater complexity and less triviality. The second thing that is happening in notions of the Death Drive is quite apart from the Fort/Da Hegelian origins of the concept. The name itself gave associative rise to death objects or conditions which then are taken to be mesmerizing, attractive, seductive to the soul, apparently again in some sort of opposition to life and pleasure. Oddly enough these gothic preoccupations actually seem to be imbued with pleasures and perverse associations. They are kind of super-charged pleasure pursuits. And somehow these ideational objects are supposed to fit in with the Fort/Da, presence and absence drive to repeat. I don’t think that this is the case at all, and I would like to turn to the figure of Zuggtmoy to illustrate it. It is not to Death itself that we are drawn, but rather to its sheen, its coverage by infintesmal molecules of light, perhaps we want to see Leibniz’s windowless monads here, or the first phosphorescence that feed on monad window elements loosened. It is the way in which disturbances in coherence (in proportion, form, rhythm, expectation) causes us to narrow ourselves and detect the living things, the forces, that cover that rift or disintegration. Just as Zuggtmoy’s slime molds scent themselves toward the bacteria that thrive upon decay, so too there is a primordeal force which feeds on the life that feeds on death. But we must pause for a moment to consider what Death is. Is it really a zero-place, a return to nil as we sometimes are inclined to believe? Is it not simply (and factually) the dis-in-tegration of composed elements? The return of nutrient richness back to a matrix of further involvement. (I am reluctantly inclined to the joke Mozart was to be found in his coffin after his death, erasing all his musical works.) A living preoccupation with Death is really a preoccupation with wholesale constitutive elements, things that must be returned to the biome in order for it to function. There is a sense that the way in which material Life feeds itself with growing complexity is by attending to the very abiotic shoreline, the biocline, at which elements become first incorporated into bodies. And Zuggtmoy, the blue-skined Abysmal queen of fungi and their kind, tells us that there is ever a ribboning and forceful consumption which preoccupies itself upon this singular and pervasive riverbed, which pours itself along every vector. On that account, that which is by my wondrous instrument’s clear power detected, what is seen is wondrous: the intestines plainly, the liver, and other organs of the viscera, swarm with infinitely minute animalcules, which whether by their perpetual motion they corrupt, or preserve, it would be in doubt, oh, for something is considered to flourish and shine as a home while it is lived in, all the same though, a habitation is worn away by continuous cultivation. Marvelous is nature in her arts, and more marvelous still is Nature’s Lord, how he brought forth bodies, thus up to the infinite itself reciprocally in his size having withdrawn, that no understanding may be attained, if it be, if one be, or when it would be of some finite size; thus if by diminishing you would descend, never will you discover where you would be able to stand…(tentative translation). …for something is considered to flourish and shine as a home while it is lived in, all the same though, a habitation is worn away by continuous cultivation. As we contemplate the Death Instinct and the biocline shore between biotic and abiotic, it would be good to follow Kerckring first-sight inconclusion. We ultimately cannot say which processes of Life, and those of Death (though certainly which are proximately of this one life and this one death). There is an ecosystem, an economy of parts in organization that was glimpsed from the first history of it. May we suggest that the demoness Zuggtmoy embodies the power of an alien, largely unseen aspect of our pre-occupation with Death. Not a drive to zero, but to the very sheen and radiance upon the decomposed, the falling to the inert, where bonds are loosened. Dark vitalism, while not my own coinage, names the force of forces (or the One) not as a pure unification but the possibility of ‘isness’ itself as well as the resulting emanations, immanences, emergences and transcendences. The ontological cascade moves from the Real, to Immanence, to Sense and finally to Transcendence. Or from existence as only possibility, to the configurations of matter and energy, to the interaction of stimulus and sense, ending with the extension of ontic being via symbols, structures, technologies et cetera. The recently coined dark vitalism or mechanistic vitalism (dark as in nihilistic but also as attached to the chemical darkness of Schelling’s unground and mechanistic in that it is deterministic) must be articulated in response to Deleuze and Guattari. If Zuggtmonic forces are driven by the chemical, proto-semiotic, machinic processes that serve a layer of un-brained intelligence which underwrites all “higher” forms of life, a celluar and contrapuntal, inter-rhythmed consumptive incorporation of elements and their living nexus radiance, then is this really a Nihilism at all? Is it not simply the de-centering of the human (and its emblem, consciousness) in such a way that we come to understand “individual” and “corporation” in very different terms. Pre-occupations with Death and Decay rather are turning to the incandesence that surrounds unloosening itself, the core operation of Eros. Is it merely a revelatory coincidence that Zuggtmoy appears from the roots of Greek for yoking together (ζυγόν; LSJ) and cutting apart (τμῆμα; LSJ)? The Zuggtmonic drive is merely the machinic intelligence of dictative weaving together of initial consumption and incorporation, the feeding of Life upon the Life that feeds on Death, yoking what has been severed in a mat of constitutive grounding, in which the abiotic is sedimentally and musically re-interwove. There is an operative consciousness of elemental contrapuntal pervasion, of female determination. Not one marked by severance and absence (however mediated) but by weave and subsumption through affective incorporation. A truly material thought. That desire, in its own realm, dances the white bones. Nicola talks of the Tiniest Diety and we questioned whether Zuggtmoy could be she. Gardener and garden – Out of damp and gloomy days, out of solitude, out of loveless words directed at us, conclusions grow up in us like fungus, one morning they are there, we know not how, and they gaze upon us, morose and grey. Woe to the thinker who is not the gardener but only the soil of the plants that grow in him! We can see where the fungal growth is relagated to an unbecoming lifeform of the worst association, but there is something brilliant here which is more than Nietzsche had in mind. Our conscious conclusion, not just our morbid ones which might pre-occupy with death, but ALL of our conscious conclusions can seem to come up out of no-where in the morning. Both our joys and our fears. 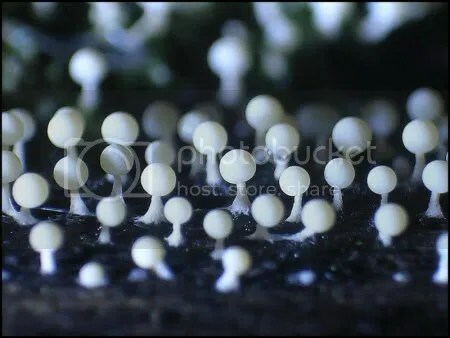 And yes, though we must garden our soil, I suggest that we must also make a garden of slime molds and fungi (and not just neat English or German perfections). There is a system below, in our soil. A music in it, and our conscious thoughts spring up in radial circles, and inching surface travels that are far richer than the molar appearances that stir and consolidate us. Zuggtmoy affectively communicates to the plant and animal realm that is within us. I think that there is more to be said of her, her powers in political status and in ontological distaff, but this is a beginning.